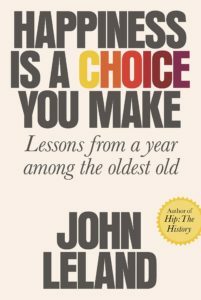 New York Times reporter John Leland joins the show to talk about his new book, Happiness Is a Choice You Make: Lessons from a Year Among the Oldest Old. We get into his year-long project of profiling 6 people aged 85+, how it blew up his preconceptions about old age and became an elderly version of The Real World, and what it taught him about living in the here and now. We also get into his history in journalism, his interest in The Beats, what it was like to arrive in NYC in 1977, the time he trained at a pro wrestling school, his decision to write a book treating On The Road as if it was a self-help book, which New York Times building he prefers, our shared love of David Gates’ fiction, and more! Give it a listen! And go buy Happiness Is a Choice You Make: Lessons from a Year Among the Oldest Old ! John Leland is a Metro reporter for The New York Times. Since joining the paper in 2000, he has covered topics ranging from the poetry of rock lyrics to the housing crisis. In 2015, he wrote a year-long series that became the basis for his new book, Happiness Is a Choice You Make: Lessons from a Year Among the Oldest Old . He is the author of two previous books: Hip: The History (HarperCollins, 2004), and Why Kerouac Matters: The Lessons of On the Road (They’re Not What You Think) (Viking, 2007). Before joining The Times, Mr. Leland was a senior editor at Newsweek, editor in chief at Details, music critic at Newsday and an original columnist at SPIN magazine. Mr. Leland is a graduate of Columbia College and a dropout from the Monster Factory, a school for aspiring professional wrestlers. He did not last long, but he got a story. Credits: This episode’s music is Nothing’s Gonna Bring Me Down by David Baerwald, used with permission from the artist. The conversation was recorded at the New York Times offices on a pair of Blue enCORE 200 Microphones feeding into a Zoom H5 digital recorder. I recorded the intro and outro on a Heil PR-40 Dynamic Studio Recording Microphone feeding into a Cloudlifter CL-1 and a Mackie Onyx Blackjack 2×2 USB Recording Interface . All processing and editing done in Adobe Audition CC . Photo of Mr. Leland and Helen Moses by Edu Bayer for The New York Times. It’s not on my instagram.